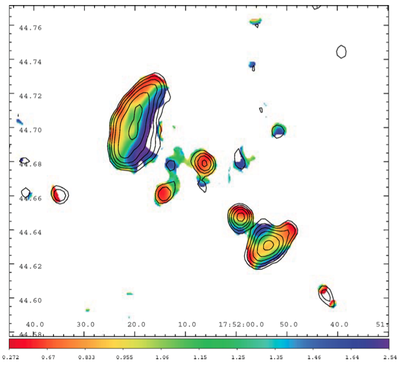 The first report of MACS J1752.0+4440 being a potential radio relic system was by Edge et al. (2003), although only in passing. van Weeren et al. (2012) observed MACS J1752.0+4440 with the WSRT and found radio relics with sizes 1.3 and 0.9 Mpc, in the northeast and southwest respectively. They also measured integrated spectra of -1.16 and -1.1, suggesting shock waves with Mach numbers of ~3.5-4.5. 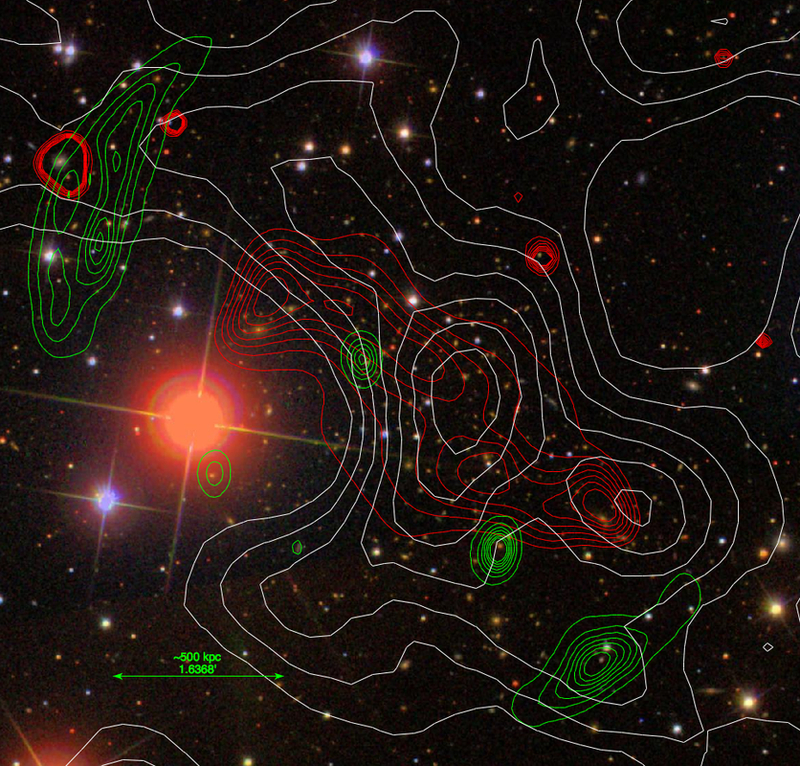 They argue that the radio relics and X-ray distribution suggest a roughly equal mass binary merger and that the van Weeren et al. 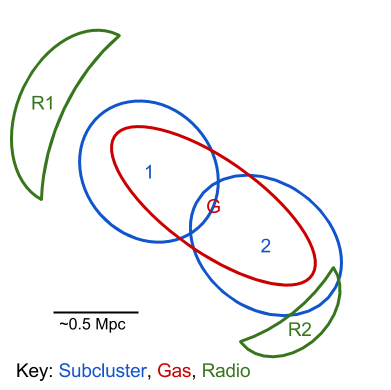 (2011) suggest that the merger has "a mass ratio of about 2:1 and an impact parameter about four times the core radius of the largest subcluster." They also note a possible radio halo associated with the system. Bonafede et al. (2012) observed the system with GMRT and confirmed both the radio relics and radio halo. They also find spectral indices of 1.21 and 1.12 for the NE and SW relics, respectively, which is in agreement with the van Weeren et al. (2012) measurements. Bonafede et al. (2012) also resolve spectral steepening across each of the relics, similar to that seen in the CIZA J2242.8+5301. They find that the NW relic has an average polarization of ~20% with values up to 40%, and the SW relic has an average polarization of ~10% with values up to 40%, with the higher polarization seen at the outer edge of the relics. They suggest that this decrease towards the inner edge could be due to turbulent motions developing after the shock randomizing the magnetic field. Based on SDSS photo-z selection of cluster members, XMM, and WSRT 18 cm. Edge, A.C. et al., 2003. 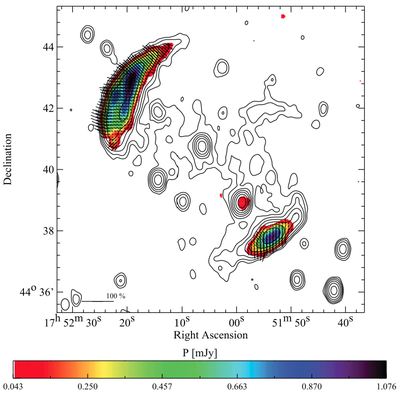 The discovery of two distant, massive clusters of galaxies in the ROSAT All-Sky Survey. Monthly Notices of the Royal Astronomical Society, 339(4), pp.913–924. van Weeren, R.J. et al., 2012. Diffuse radio emission in MACS J1752.0+4440. 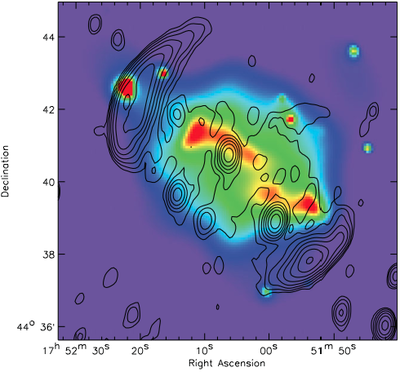 The Astrophysical Journal, 425(1), pp.L36–L40. Bonafede, A. et al., 2012. Discovery of radio haloes and double relics in distant MACS galaxy clusters: clues to the efficiency of particle acceleration. Monthly Notices of the Royal Astronomical Society, 426(1), pp.40–56.